Our cozy spa embedded in the tropical gardens provides you with the relaxing moments you seek for. Indulge yourself with an unforgettable treatment in the hands of experts and in the midst of the lovely, natural surroundings of Hotel Capitán Suizo. Massages on the beach are also offered to those who would like to enjoy the treatment while listening to the gentle murmur of the waves. It is quite likely, that afterwards you will be floating to the beach, feeling as light as a butterfly and enjoying a brief swim out to visit the pelicans. Our Spa team is looking forward to pamper your senses. 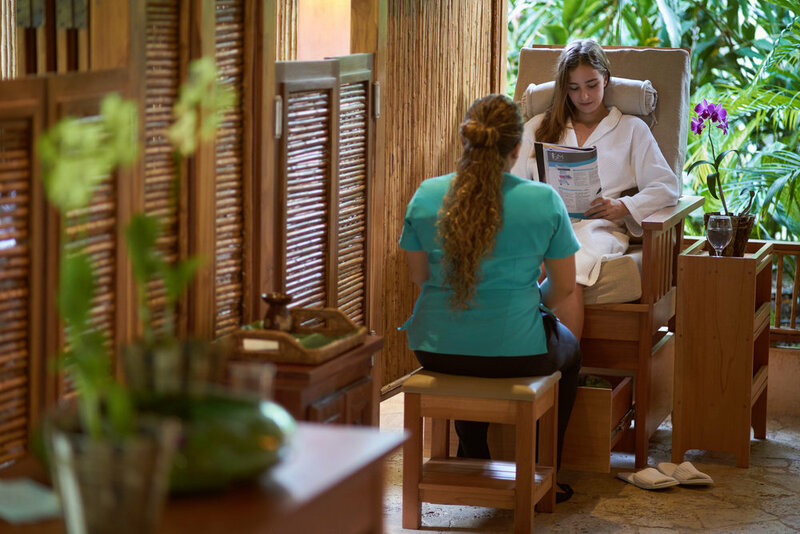 Aromas del Mar Spa is open Monday to Saturday, from 10:30am - 5:30pm. like the sea. 60 minutes. Deep tissue massage in the muscles that most need it followed by stretching. 60 minutes. Share a massage by the sea with your partner, feeling the soft breeze and listening to the melodious sound of the waves, which are so near that you can almost feel them. 60 minutes. Say goodbye to the sun with a delightful massage and then enjoy the sunset while sipping sparkling wine by the sea. 60 minutes. Renew your energies with an invigorating combination of coffee and honey, and revive your spirit, mind and soul with a gentle massage. 30 minutes. Enjoy the gift from our palm trees with a delightful coconut exfoliation that nourishes your skin. 30 minutes. Refresh your skin after a day in the sun with an aloe vera, honey and mint massage that will rejuvenate your skin, while maintaining your tan. 30 minutes. Indulge you body with smooth chocolate combined with orange that will nourish your skin as you enjoy a gentle scalp massage. 30 minutes. Treat yourself to a vitamin C application, which hydrates, regenerates and improves your skin’s elasticity, while nourishing it at the same time. 45 minutes. Awaken your senses with the sweet scent of coconut that nourishes and hydrates your skin, leaving it clear and soft. 45 minutes. Enjoy a deli cate yet profound manual cleanse and receive the rich, purifying nutrients of mud. 45 minutes. The health of your skin is in your hands. Collagen is one of the most important nutrients for your skin. It prevents the appearance of wrinkles and premature aging. 45 minutes. Obtain refreshing smoothness from vegetable and vitamin extracts, which contain antioxidants that fight against free radicals in your skin. 45 minutes. Aromas del Mar massage exfoliation or body wrap, and a facial. 120 minutes. Papaya wrap and honey and cucumber facial. 60 minutes. Head, shoulder and neck massage and cleansing facial. 60 minutes. Couple’s back massage. 30 minutes. Couple’s body massage. 50 minutes. Celebrate your bachelorette party with your friends with our private spa service. Choose two treatments from our menu, light hors d’oeuvres and a bottle of wine to celebrate. If you are having a beach wedding, we offer a luxurious package that includes a facial, massage, manicure and pedicure. Let yourself be pampered and made beautiful for your unforgettable day. or visit our concierge poolside.